What are the recommended integration scenarios for customers considering SAC as an extension platform? How do you connect ByD and SAC and what are the considerations? How to avoid known mistakes, achieve maximum benefits and best possible performance? SAP Business ByDesign is a cloud-based ERP solution, which delivers integrated and insight-driven business processes for mid-size companies. Built-in analytics is a key theme for SAP Business ByDesign and customers get the analytics content as an integrated part of their standard processes out-of-the box. What is meant by built-in analytics? User Interfaces embed analytical insights into business processes. Business users get transactional and integrated analytical content via work centers. Access rights to transactional and analytical data are managed consistently via assignment to work centers. Scoping and configuration of business process makes the related analytics content available out of the box. Insights are based on live data and it is ensured that each number can be immediately explained by navigating to the underlying business document. SAP Business ByDesign customers can use an integrated approach to adapt and extend the business objects and processes. Every adaptation is made available via key user tools for analytical data sources, reports, and KPIs. 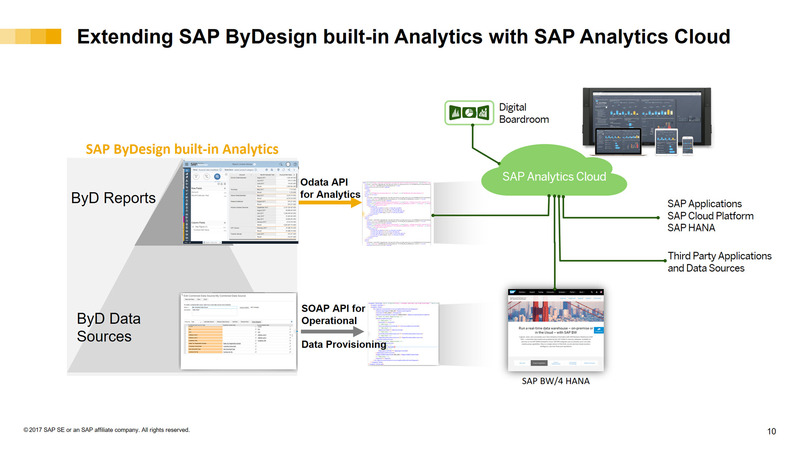 Learn more on built-in analytics in SAP Business by Design. There is no further licensing for built-in analytics required. SAP Analytics Cloud (SAC) contributes a powerful analytics extension platform in the cloud, which is based on the SAP Cloud Platform. SAC connects to multiple cloud applications and leverage data models from different cloud applications and SAP BW. It offers strong visualization and dashboarding, corporate performance management capabilities with SAP Digital Boardroom, powerful planning, and predictive workflows. Due to the strong integration of built-in analytics into the BYD solution, operational and process-centric analytics, optimizations and contextual decision making is directly done in SAP Business ByDesign. SAC is the place for cross reporting and consolidating the data of multiple sources and applications to one coherent picture. As a strong analytics platform, SAC also adds dashboarding, visualization and data exploration capabilities, which can be added on replicated BYD data in side by side reporting scenarios. Furthermore SAC adds strong planning and forecasting capabilities, which allows customer to add cross-domain planning scenarios based on BYD-data. Later the transfer of planning results back to the BYD System shall be improved. The current ODATA API is designed to deliver summary data for reporting clients. Accordingly it has limitations, when data on business document level is needed. Therefore, you cannot transfer large lists of line-item data to SAC with this approach. Please consider that the number of summary records transferred is limited and should not exceed 10000 records. SAC Documentation on ODATA Connector. Determine the user and the work center, which you would like to use for data access. We recommend to use a dedicated work center/view, which only includes the reports needed for replication. Now you get a list of BYD reports, which are assigned to your work center. Further details can be found in the documentation of SAC here. a) Consider the granularity of data. Avoid fine granular fields on document level. The current integration approach transfers aggregated report data from your BYD source report to SAC repositories. In step 3 you need to add the required fields to the “selected data” area of your Odata query. For example if you are only interested in purchasing information by month and product category we recommend to only add those fields to the ODATA query. Keeping your data on an aggregated level keeps the number of records minimal. In other words it makes a huge difference, if you add fine granular fields on business document level (e.g. the purchase order ID) to “Selected Data” of your ODATA Query. This will dramatically increase the number of records transferred to SAC, which can cause performance problems or even hit limitations. => Please do not transfer the data on lowest record level to SAC. The interface is made for aggregated summary data. A data source level integration is planned for the future. b) Prefer custom reports, when you connect to SAC. It is important to consider, that BYD delivers Standard reports out of the box. Key users can copy and adapt those reports, which leads to a custom report.Standard reports can theoretically change with every release. To keep your SAC models stable we recommend to built custom reports as basis for SAC integration. Another reason is, that the existing ODATA Interface does not support selections and relative selects applied to BYD reports. In other words: in case you use a standard report you can only replicate the data with the default selection. If you want to introduce smart filtering and relative selections, which dynamically retrieve e.g. the sales revenue of the current month we recommend to introduce those filters as default selections in a custom report. Please be aware that the SAC delivered content is not optimal for productive use. It serves primarily as a reference example. The scheduling and replication of data is done with one dedicated administration user. In order to make this integration as secure as possible, we suggest to assign all replication relevant reports to one dedicated work center and create one administration user, which is has limited read-access to only this work center. To manage the access rights on SAC side you would create dedicated users to represent each business users in BYD. Please use an Identity provider in case you need single sign on. Amounts in transaction currency must be converted into one consistent currency on SAC side. If you specify a target currency in your custom report, the data will be converted into a target currency at a defined conversion date, which could be (e.g. today) when the data is replicated -> This is not recommended, because it will lead to a differences between your BYD Data and SAC. To summarize, we recommend choosing amounts in one stable home currency and quantity fields with one consistent unit. We recommend to schedule a daily transfer of your data. See screenshot. You will always be able to match your aggregated data with your BYD System when you choose the update rule “clean and replace”. This ensures that all changes (e.g. the change of a delivery status of a sales order) are always up-to date and considered correctly on SAC side. It is important to consider, that additional data preparations steps are needed. Some of these steps are required, when the model is created and cannot be changed afterwards. Classify e.g. Month/Year fields as time dimensions and choose the correct time format. Please note that in case of the frequently used format MM/YYYY you first have to transform the data to MM.YYYY and then change the field type to time dimension. Consider that “Not assigned” values in BYD are filled with “#”. As stated before, we recommend, that you configure the BYD – SAC Integration optimized to your need. Especially considering that the granularity of your data will dramatically impacts the performance or your system. For this reason the SAP delivered business content can only serve as a reference and example and is not ideal for productive use. Please find a great example for a procurement dashboard, which illustrated the relationship of organized spending via contracts or purchase order versus maverick / unorganized spending. As stated before SAP Analytics Cloud (SAC) can contribute a powerful analytics platform to extend analytics scenario in the cloud. Important scenarios such as cross-system reporting, predictive and planning scenarios can make a huge difference. Nevertheless we strongly recommend to consider the recommendations for the current BYD – SAC Integration. If we look into the future, you will come across two types of data connectivity, which make a fundamental difference, when you use SAP Analytics Cloud. You will find live data connections for some cloud applications on the one hand and on the other hand “data acquisition models”, which import the data into SAP cloud for analytics. Please note that at the moment, the full range of analytics capabilities, including planning, blending and data preparation can only be leveraged for data acquisition scenarios. At the same time there is already a strong real-time and built-in reporting in SAP Business ByDesign, which will contribute to intelligent automation of business processes in future. This leads to the conclusion, that SAP ByDesign team continues to invest in a strong ODATA Interface on data source level, which helps to overcome the current limitations of the report-based and aggregated ODATA API. With this customers will be able to acquire data to a much broader extend and also use the BYD data for comprehensive cross- reporting, planning and predictive scenarios. As usual a very nice blog to help people. However, I am facing a very very strange and alarming issue. I mapped a lot of my models in SAC to custom reports from ByDesign. This worked perfectly up to the last updates of SAC. Now I am unable to see any custom report from the OData Analytics connection of SAC for ByDesign. Only the standard reports are there. Not a single custom reports. And the reports are well assigned to a WC+view in ByD and yes I have all the access rights needed to see them. The weirdest thing is I can see them in the metadata of the OData service, however they do not show up anymore in my connection in SAC. I am currently only able to see the standard reports of ByDesign. Moreover, this was in Production, which is horrible for the customer and also for me… as nothing works anymore. I am sorry to put this here, but I am not able to raise any incident from my SAP Launchpad as I do not have my customers SAC systems available in my launchpad. And my customer in question does not even have an SAP Launchpad. I am lost here as I do not see any mention anywhere that custom reports need a specific process to be called in SAC. Moreover they didn’t need one before the last SAC udpates. Thank you very much for your help Stefan! Thanks for your informative blog that provides a very good overview of the SAC, integarted with ByD. However, I would like to understand the difference of the OData API which you have mentioned compare to a blog written by Thomas Salvador (https://blogs.sap.com/2017/03/13/how-to-consume-an-odata-service/) on OData Service consumption. Does this refering to the same thing? As what I understood that we can use the OData API which is mainly built from the “Business Analytics” work center perspective, but as what seen about this OData Service, apparently it carries more information which I believes it is from the UI perspective. This makes a big difference which I believes reason being OData Services seems to be a connection that we can build from ByD to SAC without limiting to only information on data source or reports level. Therefore, I am very interested to know based on API and Services what are the differences and I was just wondering does the OData Services (located in the Application and User Management work center) able to cater as what mentioned for SAC OData Connection? Really hope to hear from your end about this. Our prospect is looking to report based on sales orders with a) a cumulative and b) detailed sales report with all products, prices, ship to, etc. They would like to see last year all sales orders for cumulative I do not think there will be an issue but for detail reporting we have only in one-month thousands of lines. 1.- Does the tool still have the limitation for the number records transferred of 10000 records? I’m trying to extract the report ‘Financial Statements’ from Business ByDesign to SAP Analytics Cloud. This report has the Hierarchy/Reporting structure. This structure is from characteristic G/L Account(GLACCT) characteristic property. When i pull the report, the reporting structure was not coming through. The requirement is to extract the report with reporting structure to SAP Analytics Cloud. Is there a way to extract this Financial Structure.